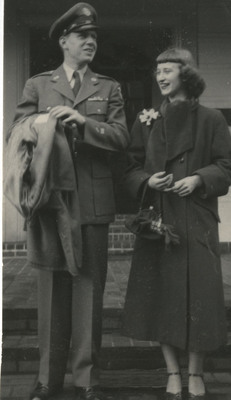 A nursing student dressed in formal wear stands with an Air Force Officer in front of one of the nurses' homes. In the Annual, the photograph is titled "Those Air-Force Men!" Unknown, "Nursing Student with Air-Force Officer" (1951). Good Samaritan School of Nursing Photographs. Image. Submission 200.